ADMP, carries on with this fascinating interview of our ‘Civil rights Babe’ and her ascent through the world of ‘Old’ media (#MSM) in the United states of america (USA) via Dallas, or Washington DC, … to finish with Paris (EU-France). Looking forward, Nita is now busy teaching and setting-up entrepreneurship programs for tomorrow’s online newsmakers and citizen-journalists. ADMP, Senior Social Media Analyst. A: – #MY NAME IS WIGGINS, NITA WIGGINS! 1. 1ADMPawards: You have started to prepare a book and an application for entrepreneurs. Can you tell us more?? NW: If you ask me what this book teaches entrepreneurs, I’d say this: In the TV industry, the product that is sold is the televised video report that the audiences watch. So every program is the marketing or selling of some type of report. Good reports prolong the career and the revenue stream. Once that is cut off, the possibility of getting new content for better jobs in the future is severely hampered. 2.ADMPawards : What will this book bring to the entrepreneur’s career? Or to anyone, wishing to further their career of choice? NW: This book shows how a person has to fight to make things happen in the career of choice. When I set my sights on reporting in a fresh, new way in Dallas, I had two considerations. -First, how would I sell my idea to a company that would pay an attractive price for my specialized product. You see, I wanted to invest my time in creating something particular. I did not want to be the regular or typical journalist who follows the crowd. -Isn’t that true of any entrepreneur? So, I had to develop in the minds of the TV viewing audience an appetite for my stories done my way. And I achieved that. I became the go-to Dallas-Fort Worth journalist who could show a well known athlete in his home setting. 3.ADMPAwards: Without interrupting your flow, being surrounded by world-class athletes, didn’t it fuel your own competitive spirit? NW: My second consideration: I knew that reaching that professional apex would fulfill me. So naturally, competitors in my field of sports journalism would want to succeed there, too. Regularly being around successful athletes and pro team owners and their entourages; plus, being at the events that the public cared about, I knew it would be competitive to land that position. So, I undertook training and licensing quite often. Beyond my in-depth knowledge of a myriad of American team sports and motor sports, I earned a license as a judge of amateur boxing and certification as a basketball referee. NW: Sure!…When Dallas-born Lance Armstrong became a powerhouse in worldwide cycling and the Tour de France, I added studying French at university to my arsenal. My good grades in French earned me a certification of professional competency in the language and membership in a national honor society of foreign language students. I outpaced the people who wanted the same career because of this unusual combination of professional and academic recognitions. 5.ADMP: Interesting…especially knowing the current doping suspicions surrounding the cycling professional Team SKY and Chris Froome, the last winner of the ‘Tour de France 2017’ – Tell us, Nita… Was writing the book, a special experience? NW: This book shows the flexibility I had to reassess every past of my life and to open myself up to accept vast new possibilities in the increasingly globalized media world. In my life, I departed from my long-held dream, my childhood’s inner voice. I embraced a career change. At age 44, the Fox affiliate TV station did not renew my contract. Because I knew it was going to happen eventually, I had mentally trained myself to be receptive to inspirations that came across my path. I had also begun to steer my professional assignments beyond the American border. And voilà, I found something across the ocean from Dallas, Texas, and in Paris, France. 6.ADMPawards : What do you have to say, to women around the globe, wishing to become entrepreneur or educator? NW: Remember, only our visions can limit us. Run toward what makes you feel satisfied. Sure, satisfaction can come in the form of money payment. 7.ADMP: Hmm…’Hope and change’… Do you have an example of such impact in ‘real life’? You want to know more?.. ⇒ For the end of Nita Wiggins interview, please do come back to this blog, next week! 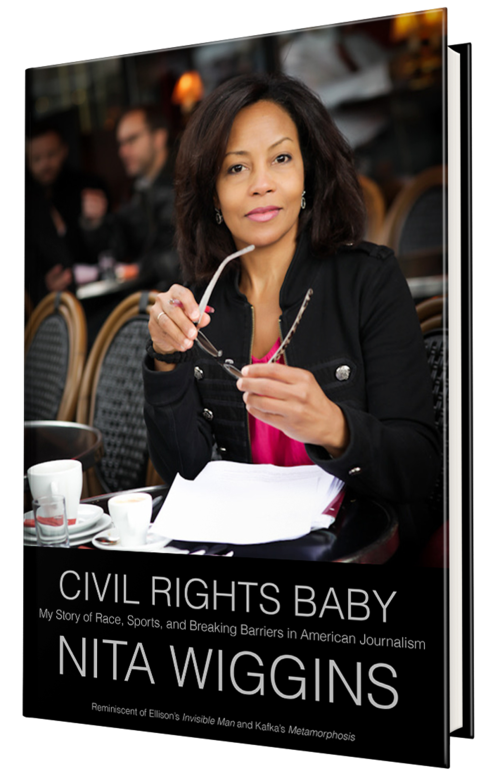 Please, keep sending your requests to broadcaster Nita Wiggins, here: Info@CivilRightsBaby.com and she will get back to you ! Stay tuned and keep reading, liking and commenting this blog, please!